Will the quartet play outside? Do you require any equipment? We need four arm-less chairs, although apart from that we provide all of our own equipment. It takes us 5 minutes to get set up, although we always allow 20 minutes at the very least so we are ready to strike up with plenty of time! What do you wear for performances? Our female performers normally wear all black, while our male performers wear black tie. We are very happy to accommodate any dress requests should you have them. For example, for less formal events we have worn summer dresses and day suits. You don't have my favourite piece in your music list. Will you be able to play it anyway? Absolutely! It's very important to us that we play music that you and your guests would like to listen to, so we do everything within our ability to accommodate requests. We've not let anyone down yet, and we don't want that to change! Our fees include two requests at absolutely no extra cost, and any additional pieces to that are £20 each. We do indeed. If you need any further information for your venue, let us know. We come from all across the Midlands, from Stourbridge to Market Harborough. How can I be sure you're all good quality musicians? 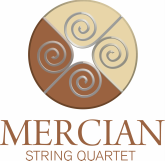 The Mercian String Quartet is formed of recent graduates and current students, which means that we are at the peak of our training. Our musicians have trained across the country at the University of Cambridge, Birmingham Conservatoire, the University of Manchester, Royal Holloway (University of London) and the Royal Northern College of Music amongst others. Click here to find hear from people like you who have worked with us before. What happens if my event overruns? If we don't need to rush off to another event, we are able to accommodate delays of a few minutes. After that point, we charge 1.5 times our usual fees, and we invoice for this after the event. If we think there is a risk that the event will overrun, or if we can see in advance there would be a problem with us staying longer, we will let you know immediately. For us, it is all about communication. To confirm booking we require a £50 deposit (unless previously agreed otherwise). We send all payment information by invoice, and acknowledge all payments we receive asap. Mercia was one of the Anglo-Saxon kingdoms, and broadly covered the midlands of modern-day England. So, in terms of the latter, much like us!